I wanna spend over 3 minutes talking about NOTHING but promise to use about a few seconds afterwards to talk about SOMETHING. Just one life page; a dot becomes the attraction, its odd colour the seduction. Is it a question of confusion? What do you see in your vision; a stain or hope? An assault or a salt that heals? Pick your option. Losing far to Lucifer's moves; a move meant to make me cycle in a circular movement. A motion as stagnant as stacked ants in an emulsion. Just to appeal to emotions, we call it slow motion. Hahaha! Slow and steady, isn't it? Yet we're talking the motion that sparks demotion from grace to grass; I call it progress for the sake of progress. I've seen it; how SIN eats up the heart of man to exchange his crown for just a hat. Who can understand how SIN overstands in the heart to make it desperately wicked using a headache to turn you into a weak head. You hurt, yet create a resting hut for SIN in that same heart. The seen facts paint a scene that SIN is sweet, sidelining truth. SIN polishes you into a black sheep, yet, you think you shine? With yeast makes you rise, forgetting you're empty within? SIN is a cake for the stomach called stomach cake that causes ache for the stomach called stomach ache. SIN is a sickle cell disease; a sickle that cuts your rise short. SIN is a stain that strives to strain off life; the spiritual AIDS that comes to no one's aid, a dirty spot that keeps you in one spot with the shape of an oval flow that tries to negate the over-flow of SOMETHING called GRACE. Yet, this sin is NOTHING when not in you. NOTHING, even if Satan keeps noting you. All right, spent minutes talking about NOTHING; now left with seconds to talk about SOMETHING. SOMETHING that exists to make sin NOTHING. If you feel you're enjoying SIN, you're enjoying NOTHING; now, GRACE, is SOMETHING. SIN is a go-to-hell that plucks you down while GRACE plugs you up to heaven. Yes GRACE; God's Riches At Christ's Expense. Oh, Yeah! 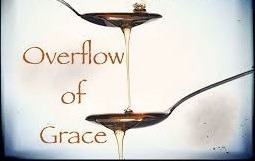 GRACE; the grease for the race to raise our ways to any eyed place of the most high through high praise. This GRACE that preaches and teaches riches unlost and abstinence on lust; it has appeared to all men, yet, only the poor in Spirit accept it to keep walking in it. GRACE is the only riches that can afford not only your fare to heaven but fee through heaven's gates.